At $3.67, US Regular gasoline prices are their highest since March 2013 having risen over 12% (40c) in the last 2 months. This must be great news, right? It must mean world demand is picking up and driving up prices of crude oil as global trade soars (amid a collapsing Baltic Dry and decelerating Chinese growth). This can't be related to "war premia" right? - as we noted here - because stocks (which always know best) have discounted all this tomfoolery. 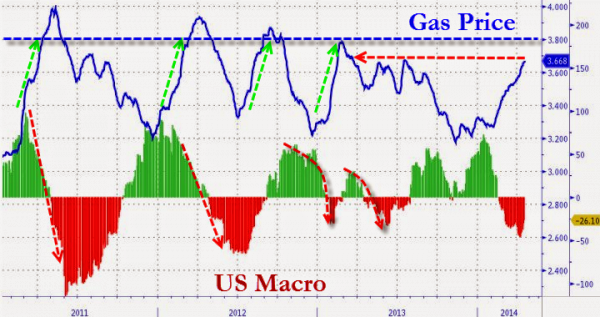 However, as the following chart shows, each time gas prices have surged up toards the Maginot Line of $3.80, US macro-economic fundamentals have collapsed... the only problem is, this time is different - because macro data is already weak going in (and expectations for the post-weather pop are high).